We were about a third of the way throughwhen my 9-year-old asked skeptically, "Mommy, where are the girl characters?" We were about a third of the way through The Hobbit when my 9-year-old asked skeptically, "Mommy, where are the girl characters?" "Well, unfortunately, there are none," I said. My daughters and I were enthralled with Bilbo Baggins' magical adventure through Middle-earth. We loved the songs, the dwarves, the magic ring and the quest for a dragon's horde of gold. But while hobbits may be gender-neutral creatures, let's be honest -- aside from the occasional elf, there are no females in Tolkien's fantasy world. The long-awaited third installment in John Stephens' bestselling trilogy, The Black Reckoning continues the story of three abandoned children fulfilling a deadly prophecy. Kate, Michael and Emma now know they are guardians of the sacred and magical Books of Beginning, ancient tomes that if united can make and unmake the entire world. Youngest sibling Emma has always been a fighter, and fueled by anger and grief, she embarks on her quest for the final volume, The Book of Death. Emma is the most compelling, courageous and volatile of characters, and my daughters and I can barely put down The Black Reckoning at bedtime. 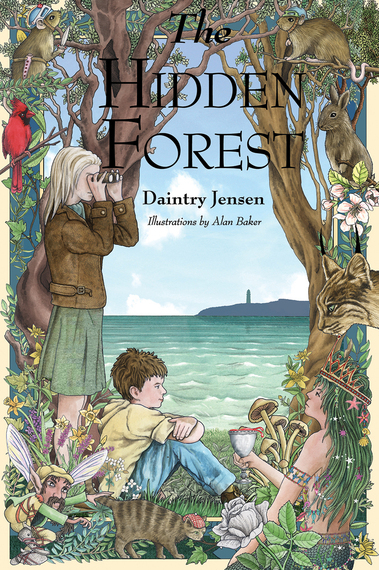 An enchanting adventure set on the shores of Nantucket island, The Hidden Forest offers the promise of a magical world just beyond our own. When 12-year-old Adelaide is sent to spend the summer with her grandparents, she climbs over a forbidden wall and encounters a secret rose, a talking lynx and an evil Merqueen with violet eyes. Inspired by her explorer icon Amelia Earhart, plucky Adelaide shows her mettle, stands up to the queen and saves Nantucket and her family in the process. With gorgeous illustrations by Alan Baker, Daintry Jensen's middle-grade tale is a fast read, the perfect book for a hammock on a lazy summer afternoon. Second-grade BFF's Ivy and Bean are back in their tenth book, this time trying to solve a real live mystery unfolding on their street, Pancake Court. When a mysterious yellow rope appears overnight, Bean acts the role of hard-nosed, old-school detective while Ivy offers imaginative support and the neighborhood children assist. Hilarious and inventive, Annie Barrows' latest tale provides laugh-out-loud fun for children (and parents) of all ages and also asks deeper questions about imagination and reality. Quiet, thoughtful Ivy and feisty, witty Bean are two girls you want as your friends. A great audiobook for a long car ride. 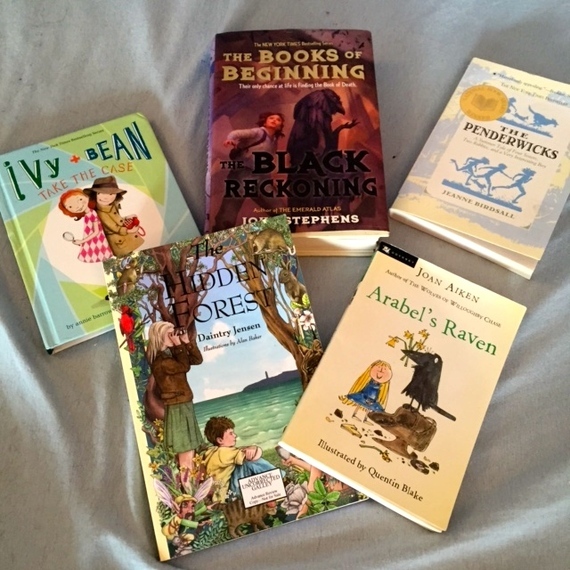 Beloved British children's author Joan Aiken has written dozens of fantasy books, but my family's favorite is the classic caper Arabel's Raven, about a ravenous, trouble-making, hairy black bird and the little girl who loves him. One rainy night in London, Arabel Jones' taxi driver father finds an enormous raven lying unconscious on the road. He brings the bird home, and Arabel names him Mortimer, pulling her new best friend around in a red wagon. Together, the two catch jewel thieves, go roller-skating and generally get up to mischief. Smart, soft-spoken Arabel and her love for the incorrigible Mortimer will warm your heart. Worth reading for Quentin Blake's hilarious illustrations alone. In this quintessential summer holiday story, the four Penderwick sisters find themselves staying on a beautiful estate called Arundel for their vacation. With the company of the bumbling family dog, Hound, they explore the magnificent grounds and make friends with a lonely boy named Jeffrey, as well as the handsome gardener, Cagney, and his two pet rabbits. It's hard to choose which Penderwick girl is the most endearing: responsible oldest-sister Rosalyn, adventurous, blue-eyed Skye, imaginative bookworm Jane, or sweet, vulnerable baby-sister Batty. Unfortunately, Jeffrey's heiress mother doesn't find the Penderwicks so likeable, and a host of trouble ensues. A summer classic about friendship, family, loss, discovery, and growing up. Let's keep the list going! Who are your favorite children's book heroines?